The cactus belongs to the family Cactaceae, which encompasses almost 2,000 different species, according to the Aggie Horticulture website of Texas A&M University. The cactus is an iconic representation of desert plant life, known for its prickly needles and often towering height. The plural form of cactus is "cacti," and there are a number of descriptions of certain traits that identify a plant as a cactus. Most cacti are only native to the Western Hemisphere. They are naturally found from the southernmost point of South America to the southern prairie region of Canada. One species, the mistletoe cactus, is the only true cactus species that is also found in the Eastern Hemisphere. This cactus does not look like a traditional one, as it is purple and shrub-like with long fingerling branches and berry-like fruit. Other cacti that are found in the Eastern Hemisphere, including Australia, are introduced species. While cacti are typically desert species, they can also be found in mountain regions and coastal plains. One of the key features in the botanical description of a cactus plant is that it has clusters of spines, which are unique to cactus. Unlike the prickly parts of other plants, such as pine needles, cactus spines do not act as leaves or contain any cells or signs of life. In most mature cacti, the spines are dead. The spines serve a few different purposes, such as providing the cactus with shade, protection or attracting pollinators by secreting nectar in a select few species. Cacti are unique among many plant species for their ability to adapt to extremely dry environments. They don't have leaves, so photosynthesis occurs in their trunks. This is a unique process that only happens in cacti and does not even occur in other succulents or closely related plants. Cacti also have special wax secretions to prevent their water from evaporating, along with the shade-giving spines that also prevent this evaporation from happening. Cacti are also capable of absorbing large amounts of water during rare rainfall, more so than most plants. 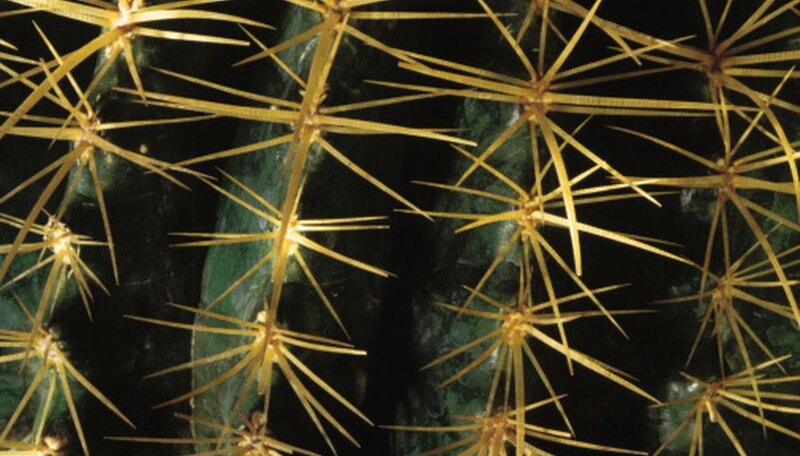 One feature that only cactus plants have is areoles. These are the small bud-like bumps from which the cactus spines protrude, which are evolutionary remnants of branches from cactus ancestors. Other plants with needles or spines do not have areoles.